There are lots of different web hosting companies out there. If you’re looking for a place to migrate your existing site or to build your very first site on, you have more options than ever before. The good thing is that many of these web hosts now offer affordable and incredibly feature-packed hosting packages to suit your specific needs. The third website I’ve launched a few years ago is hosted by FatCow. There weren’t a lot of choice back then, and FatCow stood out so I immediately signed up for an account. I was looking for a hosting plan that comes with a lot of features and doesn’t cost an arm and a leg. The company’s name is a little strange too, but I liked it! What’s more, they’re an eco-friendly web hosting company that’s very active in social media. What’s not to love, right? But the things I was looking for in a web host were plain silly! I’ve listed all the wrong reasons to base my choice on, so I’ll tell you the things that really matter: pricing, customer support, control panel, uptime, and overall performance. These are what you really need to look for in a web host. If a web host ticks all these boxes, then stick with it! FatCow is a very special web host. The way they deliver their hosting packages, the way their website looks and feels, the way they provide their services to clients – everything just feels different! Being one of the veterans in this industry, I just knew they’re doing something remarkable to keep their customers satisfied. I just had to sign up for an account and make a review about their service. Fast-forward to today and FatCow is still doing a great job. It may not be everyone’s top pick now, but if you’re on the lookout for a really cheap web hosting plan, then this one should be under your radar. But can it still be a good web host if you strip away the pricing factor? Well, that’s what we’re going to talk about today – going through all the details to find out whether or not you can count on FatCow’s web hosting to keep your site up and running all the time. Why Choose FatCow Web Hosting? FatCow may be a web hosting company with a funny name, but they’re serious about providing the best service to their customers, with a price that you just can’t beat. 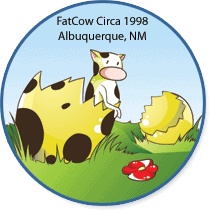 First established in 1998 in Albuquerque, New Mexico, FatCow has been a popular choice among individuals, as well as small- and medium-sized businesses looking for a cheap hosting solution. With a dedicated team of web hosting experts, they focus on a more customer-friendly approach that aims to do a lot more to meet client need. This is one of the many reasons I included FatCow in my top 10 list of web hosting providers. As a company that has been around for more than 15 years, some of you might say that they’re lucky to have lasted this long in such a competitive market. But anyone who’s successful – no matter what industry they’re in – knows that it’s not luck but hard work and dedication that got them to where they are today. Now that you know a little bit of FatCow’s history and goals, it’s time to get into the more important stuff: FatCow’s hosting plans, their features, customer support, and other bits and pieces you should know about before signing up. Don’t be fooled by this web host’s playful nature and fondness for using words like “oodles” and “udderly” throughout their site because they take what they do seriously! They pack a whole bunch of features in attractive hosting packages while at the same time cutting away most of the jargon that’s common in other web hosts. FatCow offers shared, Virtual Private Server (VPS), and dedicated hosting plans to help you get your fair share of the Internet, right out of the box. For WordPress users, they also provide managed WordPress hosting. First time building a website? It can be a pretty daunting tasks, especially if you’re not tech savvy. Good thing FatCow offers a feature-packed shared hosting plan to help beginners hit the ground running. They’ve even assembled a team of experts to help their customers every step of the way with their Friendly Moo Crew Support Team. Called The Original FatCow Plan, this robust, all-inclusive shared hosting package is the perfect starting point for those who are just about to launch their site on a budget. And if you want to save more money, you better sign up today because FatCow is offering a special introductory rate on their shared hosting plan, starting at just $49 per year! You can save up to 60% on this limited-time deal so you better hurry because this sale will end soon! This offer already comes with a FREE domain name. What’s more, FatCow will even set up your site for FREE. That’s right, no setup fees on your first site! A lot of web hosts will make you pay for your first domain and will even charge you with costly setup fees, so these alone are pretty lucrative offers. But as with any web host offering a special intro price, this limited-time promotion is only available to new clients during the initial term. This means that you’ll have to pay at the regular rate for successive or renewal periods. But just imagine how much money you’ll save on your first year with FatCow!